I’m thick in the midst of an overwhelming first week at my new teaching gig — nothing terrible, just an awful lot of newness coupled with the usual hectic pace of any new school year. Happily, coming home in a state of exhaustion has been made much easier by the serendipitous arrival of a few great folkrock and folkpop covertunes in my mailbox. Not much writing left in me today before I drop, so this will be a pretty short treatment all around, but here’s three new high-cred, high gloss covers that are keeping me going long enough to make it home to the couch each evening. Amie Miriello is the newest of today’s artists, and a true shot in the dark from the inbox; I usually don’t even listen to unsolicited music that comes via email, especially not artists who come tagged with “folk rock” as a third choice MySpace afterthought. But though it speaks volumes about mass media usurpation of “folk” as a term of legitimacy, it also says surprisingly good things about the industry writ large that the same A&R exec who found Destiny’s Child, Beyonce, and Jessica Simpson has chosen Miriello’s wonderful debut album I Came Around, a set of songs which range from powerful radiopop to more understated high-production folk rockers, as a platform to launch her newest label BellaSonic. Okay, let’s be honest — if you’re a regular visitor here, such name dropping is more likely to be a turn-off. I was wary myself, when her rep sent along a press release that described Amie’s style as “defined in the genres of folk, rock, pop, and alt-country”; as the best bloggers have learned, tagging your darling with too many broad genre designations is hardly ever a good sign. But since the email, I’ve had a chance to listen to the album all the way through, and from the sweet title cut to the end of the line, it’s got earworm written all over it. Miriello’s voice is authentic and controlled, and her songs confessional and real, in ways that transcend the high-gloss pop of those who preceded her. This Smashing Pumpkins cover — recorded live, and released as a web-only download to promote I Came Around — is a perfect showcase for this versatile new talent. The song manages to retain the tempo of the original, but replaces the strained tension of the original with a much more restrained folk-pop, couched in sweet-voiced vibrato and doubled harmonies, reminiscent of a certain mostly-acoustic Stevie Nicks ballad. The total package manages to keep the energy high throughout while allowing for both a more subtle approach and a much larger build when the song really lets loose in the last 40 seconds or so. Folk or not, with that powerful voice and a wonderful production team behind her, I expect Amie Miriello to go far. The album is much more produced than the live cover, but instead of Beyonce, you’ll hear shades of Brandi Carlile and Regina Spektor and Tori Amos; good stuff, all around, and not a Britney in sight. I Came Around hit stores only yesterday; head to Amie’s website for catchy streams, and then snag the album here (or download here), so you can say you were in it from the beginning. Long time folk rocker Melissa Ferrick isn’t always to my taste — the older Patty Griffin cover I’ve included below is a bit too punk, and a bit too off-key, to keep on the playlist for long, though it makes for a good curiosity. But Ferrick has a solid reputation on the line where rock and folk meet, especially among those who collect LGBT folk music, and especially of the slightly angry type. And when Ferrick tones things down, I find she brings a wonderful held-back tension to her work which combines the vocal rasp of the Indigo Girls or Melissa Etheridge with the guitar tone and songwriter’s sensibility of Ani Difranco, Bruce Springsteen, and others on the new urban folk tourbus. Like so many other artists, Ferrick joins the digital age this month with the release of Goodbye Youth; the album will only be available in one of two ways: as a download, and as an on-tour only CD release — a nifty way to explore the new post-millenial model for performers, in which touring and downloading provide the bulk of an artists’ bread and butter. “Touring is my livelihood, and indie retail is dead” is a pretty bold and revealing statement from an artist who’s been around for decades, but adapting to new models shows that music remains vibrant; the two approaches to participatory music ownership that the album release encourages — intimacy and full-bore stage show — represent a pretty broad spectrum after all. This bare-bones streetcorner cover of Bush’s Glycerine promises that this newest album from Ferrick will lean in my favored direction, and it offers a great taste of Ferrick’s restrained style, sure to please the uninitiated and the long-time fan alike. It’s also rawer than the original, believe it or not — no small feat when the original we’re dealing with is a recognizable radio anthem from the thick of the grunge era. Here’s hoping Ferrick’s new work, both on the stage and in the ether, is the one that finally breaks the mass recognition barrier. 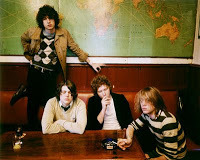 Finally, indie blog darlings and magnificent coverhounds The Kooks aren’t folk: Wikipedia lists them as indie rock and indie pop, and though their MySpace page is closed for repair, leaving us bereft of the usual three-genre designation, it seems safe to say that their usual album output is on a par with the shimmery, pulsing radio-ready britpop that manages to combine the throwback sound of the british invasion with a heavy dose of neo-indie rock and roll. Neither are The Kooks as unknown as our usual featured artists here on Cover Lay Down, though many folkfans may have missed their rise to fame over the last few years of blogpress and top charting radio play; these guys are millionaires by now, thanks to a triple platinum debut and a second album released just this year which has already soared to the top of the charts. But there’s something about this brand new cover of Kids, performed just recently on Australia’s Triple J by Kooks guitarists Luke and Hugh, which just screams out for a sunny afternoon folk rock set in between singer-songwriters at some summer folkfest. Maybe it’s the energy, maybe it’s those folkharmonies and that short, simple acoustic guitar solo, and maybe it’s just the lightheartedness that the new fab four bring to all their work coupled with the duo-only, stripped down acoustic in-studio experience. Whatever it is, the tune is a perfect upbeat addition to any good indiefolk mixtape, and I’m proud to pass it along here, along with a bonus, for all the cool kids. Cover Lay Down publishes Sundays, Wednesdays, and the occasional otherday.